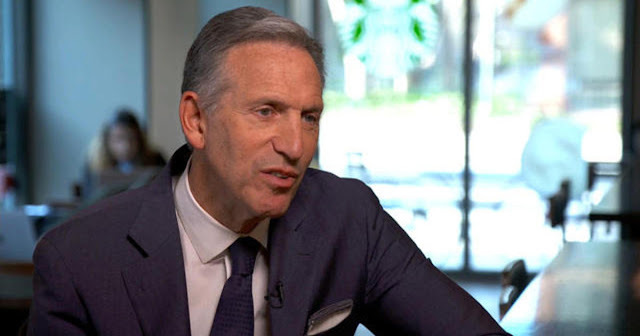 Howard Schultz, the former CEO of Starbucks, appeared on CBS 60 minutes recently and declared that he was considering running for President of United States of America, as an independent. The rebuke from the left was swift, predictable and harsh. The New York Times ran an opinion piece calling Mr. Schultz “irresponsible and self-centered”. Vice wrote that whilst he was not the first billionaire to run for President, he was “the most disconnected from reality.” There were also public threats to boycott Starbucks. The boycott threat was led by Neera Tandon, a longtime Clinton acolyte, who served as Mrs. Clinton’s policy director for her first failed presidential bid. The justice editor of a left-leaning publication, Think Progress, said that if Mr. Schultz runs, the Democratic National Committee and "major unions" and "major presidential campaigns" should "all use their email lists to promote a Starbucks boycott until he drops out." Sadly, boycott calls have become a standard bullying tactic the left uses whenever someone does or says something they disagree with. I was disappointed because this pushback confirmed that liberals no longer believe they have a persuasive argument or that they can win people with ideas. Instead, much like Mr. Trump they resort to bullying and browbeating anyone who dare challenge or expose this truth. Democrats fear Mr. Schultz will split the anti-Trump vote and hand Mr. Trump a second term. This is a valid concern. However, what Democrats fail to understand is that there is a deeper malaise within liberalism that needs to be addressed, and it has nothing to do with Mr. Trump. Liberals have long refused to acknowledge that the Trumps, Modis and Bolsanaros did not win - liberalism lost. Over the last fifty plus years liberalism grew complacent and ignored the growing economic inequality and social divides prevalent in every democracy. Liberals forgot that democracies, like gardens, are fragile and need constant tending. As a result, what remains today is a vapid shell of liberalism; one that stands for nothing but is against everything. It is defensive, cowardly and quick to chastise everyone, but offers no alternate vision. Our problems are deep, messy, and have been building over generations; there are no “big ideas” or quick and easy solutions, it will take more than one generation to fix them. However, unless we start to have the prickly, honest conversations and dig into inconvenient and uncomfortable issues, we will continue to create room for extremists and false prophets, on the right and left, who will gladly fill these voids with superficial, dangerous and divisive solutions. I don’t want to defeat Trump; I want to address the root causes that enable people like him to win power in the first place. And the only way to do this is by offering a bold new vision for liberalism. One that is rooted in humility, civility, compassion and recognition that nobody has the answers. We will need to work together, across the political spectrum, to solve our deepest and most intractable problems. There is already a grave danger that the continued and increasing lack of unity and disarray within the Democratic Party will likely result in Mr. Trump's winning a second term. A party that might field twenty-five to fifty plus candidates stands for nothing and will never offer a compelling vision. They will be too busy infighting and their candidates will need to resort to being outrageous or to positing extremist views, simply to stand out in a crowded field. I have sounded the alarm bells before. More than six months before the 2016 election, it became clear to me that Mrs. Clinton’s tone-deaf campaign and Democrat’s lack of cohesive message and vision was going to allow Mr. Trump an unlikely path to victory. I wrote to her campaign begging her to drop out, suggesting that if she loved this country she would let someone else run. Today, I am convinced Democrats are lulling themselves into the same false sense of security that Mrs. Clinton did, because they are once again unable to see past the President’s low poll numbers, historic unpopularity and the large number of investigations into his business and political activities. It is naïve and dangerous to think that any of this will translate into electoral support for Democrats from independents and anti-Trump conservatives. Especially not when they are running around championing socialism as the answer to all our problems. The fact is that the majority of independents and anti-Trump conservatives I know find themselves without a party, and Democrats have shown zero interest in courting these voters. So I am convinced that the threat of an independent, centrist candidate is the wake-up call needed to ensure Democrats do not hand Mr. Trump his second term on a platter; like they did his first. I admit my logic might seem counter-intuitive to some, but there is one thing I have learned about human nature; people do no act in their self-interest until there is an imminent threat. Consider that most young people do not spend money on health insurance simply because they have fewer ailments and feel healthier than older folks. By the same token most people do not buy renters insurance until they experience a pipe burst, a burglary or some other catastrophe. I believe Mr. Schultz has integrity and would make a great President. I see in him a humility that is completely missing in our political class. If the politicians attacking him did a little research, they would find that while they have been busy making grandiose promises, Mr. Schultz was implementing solutions. Starbucks provides quality healthcare and college tuition for all of their employees and is also working to employ thousands of veterans, youth and refugees. Mr. Schultz’s candidacy will also compel the party to have a real debate, not superficial ones. It will force them to clearly articulate what liberalism stands for in the 21st century. They will need to present a unified platform and message derived from assembling the most viable ideas from different factions within the party; rather than have them compete. Also, they will not be able to placate a subset of their base with a populist or extreme agenda, and will need to appeal to the broader electorate. The threat of Mr. Schultz splitting the vote will ensure they can no longer sidestep this debate. Mr. Shultz will challenge them with his ideas (we are yet to hear them) - good, bad and sometimes half-baked - and will force them to stake coherent positions on messy and uncomfortable issues. I have no idea what Democrat's position on immigration is. They will be forced to offer solutions versus platitudes about equality or utopian dreams of quality healthcare, universal income and college for all. To take on and defeat Mr. Schultz they will need to rally around a few nationally viable candidates, deliver a unified message and will not be able to get away with simply vilifying Mr. Trump or following him into the gutter. They will be forced to address all that is broken with liberalism, our political process and craft a new vision that has appeal for ALL Americans, not just for specific groups. Democrats are acutely aware of this and that is why they are running scared of Mr. Schultz. It is interesting that the people attacking him most vehemently are people from the party that lost to Mr. Trump. The media pundits claiming that there is no path to victory for an independent candidate are also the same ones who assured us that Mrs. Clinton was going to win. America’s founding fathers didn’t want political parties as they feared factionalism. The two-party system today is their worst nightmare. Perhaps, the time has come to break the duopoly, partisan bickering and constant gridlock that do nothing to serve the people. Mr. Trump lacks integrity, maturity and the temperament to lead, but to defeat the forces of Trumpism, Democrats must beat him at the ballot box with their ideas, not with more extremism or threats of impeachment. There is no question that there are short-term risks of an independent candidate running, but the long-term cost of not starting this debate, combined with the Democrats dangerously erroneous path, will be much more harmful for liberalism and for democracy. Complacency is abhorent and paralyzing...cheers to waking up and being proactive and productive.